It's really been some time since I wrote something. I've been really busy - more than usual busy with all the projects but additionally busy trying to workout a solution to some of my perennial problems. 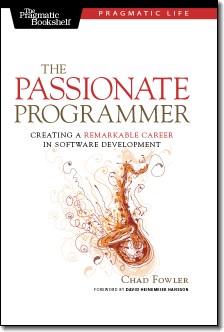 I finally managed to read The Passionate Programmer. It almost felt like reading my own notes. Over the past few years I've been talking and writing about quite a number of issues from this book. It's almost unbelievable that somebody has so similar views. Starting with the saxophone experience - I played saxophone for 10 years - I can relate really well to Chad's stories and parallels. Of course, that's not to say that because some things work in music they will work in programming as well. As Martin Fowler once said software development is software development and we shouldn't be comparing ourselves to other industries and drawing misleading or wrong parallels. Anyway, regardless of whether the conclusions are right or wrong the flashbacks to saxophone playing experience added extra level of depth (at least for me). The nerve!!! Judging by the reactions I receive whenever I talk about importance of proper education and practice for programmers - it's ranking among the worst insults you can ever make. Every programmer worth his salt knows that learning is for dummies. We were born better than them (basically everybody else). Sarcasm aside, I believe that a lot of programmers would benefit from experience of playing a musical instrument. Daily (i.e. every day) practice and performances. When you're performing on stage without practice - okay let me rephrase that - when you're on stage without hundreds of hours of practice - you're very likely to screw up - and if you do you're like naked. There's nowhere to hide. The whole audience looking at you and everybody knows it was you who screwed up. Believe me, the next time you'll think more than twice before coming on stage without proper practice. When you program without practice (or learn on the job) you're just as likely to screw up...the only difference is that you can blame it on the customer, on the specs, on the technology, or whatever or whoever else around you. Many times you can just comfortably hide behind your boss as he/she is the one facing the customer. This is an interesting concept. In the industry where everybody complains about way too tight deadlines - Chad goes on to say that just by making the deadlines even tighter you can easily double or even triple your productivity. While I am still to meet an employee that would confirm this - it's definitely true for me and all my ex-staff that went independent. It's really fun to see that things that took them several months to finish while being employed can suddenly be done in a month when they're on their own. "If you can’t organize your thoughts in your mother tongue so that others can clearly understand them, how can we expect that you can do it in a programming language? The ability to shape an idea and lead a reader through a thought process to a logical conclusion is not much different from the ability to create a clear design and system implementation that future maintainers will be able to understand." While this politically incorrect statement would get you to prison in a number of countries it's surprisingly true. And quite opposite to the geek stereotype. Interestingly enough, ability to speak and organize thoughts clearly has become a very important factor for us. Try to notice the similarities between way people speak and code - if you have a programmer that is very verbose - talking, talking, talking and still not making the point clear - chances are his code will be very similar - long winded, using unnecessary constructs and never quite clear on what it's supposed to do. On the other hand, if you have an introverted programmer that says 10 words a day, chances are his code will be very terse, taking one liners to the whole new level. A thing you learn really fast when you're on your own but it's your biggest enemy when you're an employee. I remember a fight I had with one of my employees - his conclusion was that he just wanted to have a life. And he was right. Why should he worry about the deadlines or delivering what the customers needed? His goal was to have a life and the work was one of the main constrains - there was no direct link between his performance and quality of life. Not seeing and understanding this was my biggest failure running the business earlier on. While we had the basic performance based structure in place it was so detached from the company's culture and pretty much left for everybody to make their own interpretation. The challenge is to reorganize from a black box to a concert stage where everybody is crystal clear on how his performance is linked to the achievements of the whole team and how that translates to the distribution of rewards. Chad puts it very bluntly: "Sure, you got it done, but what was it? Why did it matter? How was this so-called accomplishment not just a waste of company time?" He couldn't be more right. I cannot even count how many times people told me that they had been making sacrifices, sitting in the office 8 or 9 hours every day and I still complain about their performance. The issue here was that while they counted hours I was counting closed iterations and customer satisfaction. Especially when our technology of choice is the underdog... I believe this idea comes from the Pragmatic Programmer - something along the lines of when all you have is a hammer everything starts to look like a nail. I've always tried not to be attached to technology, however, having a 50 projects investment in a technology makes you very close to being dependent on whatever choices you made. Yet, an investment in wrong technology - no matter how much you like it is usually much higher than investment in a different technology that is actually right for the job. This is quite a dangerous point. While definitely true - there are uncountable advantages to running your own show - just go for any motivational seminar by T. Harv Eker, Robert Kiyosaki and the likes - but being the best technician is only a start. Even though, based on the book 50 Great eBusinesses there's a number of teenagers without any experience that are managing billion dollar businesses (or one man shows) out of they're parents living rooms - vast majority of businesses and people are not so lucky. While Chad describes this as natural next step and spends only a few pages explaining the benefits and some of the obvious challenges it's a whole new ball game - one that has very little to do with programming.